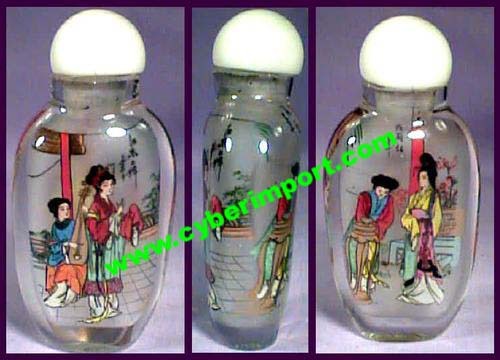 OUR ONLINE CATALOG and this reverse paint geosha snuff bottle page serve as a cross-section of our China exports. Greater variety is available. Email us a photo example of what you seek. Export prices often change. All are re confirmed after your inquiry. You will be emailed a pro-forma invoice offer. Ladies outdoors on front, lady through a window on the reverse. Jade-green glass stopper, bone spoon. Court ladies. One playing a stringed instrument. Another bowing to a lady of higher class. White glass stopper, no spoon. Renditions of one of Japan's most famous Floating World painters: Utamaro. Both sides have Geishas. Agate stopper, bone spoon. sbrpge001 $5.67 20 2 1/4" 1 3/8"
Rendition of an art deco era fantasy work by E. Duloc from about 1913. Asian style painting by a non-Asian! Agate stopper, bone spoon. Renditions of one of Japan's most famous Floating World painters: Utamaro. Geisha serving tea to gentleman, and portrait on reverse. Agate stopper, bone spoon. Renditions of one of Japan's most famous Floating World painters: Utamaro. Geisha with fan, and another serving tea. Agate stopper, bone spoon. Portraits of geishas, boths sides. Agate stopper, bone spoon. Portrait on one side, full view on reverse. Agate stoper, bone spoon. Lady in a garden on the front. Calligraphy and flowers on the reverse. 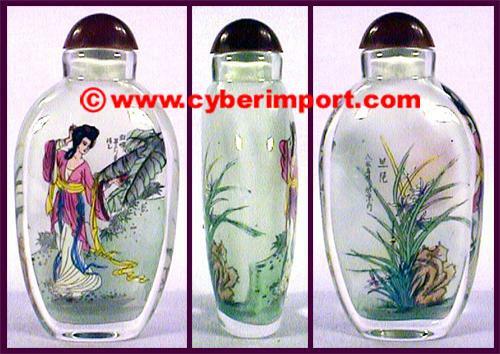 Reverse Painted Snuff Bottles are among the more ingenious of the Chinese passion for this art form. 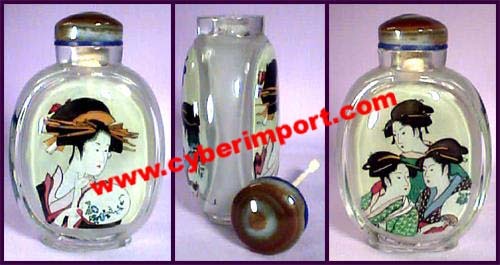 Small, curved brushes are devised by the artists themselves to reach inside the bottle's mouth to paint their vision. If that isn't hard enough, they layer their picture in reverse! 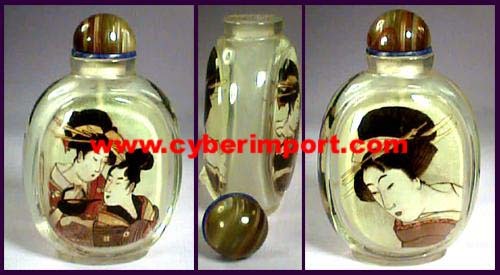 What goes on last on a normal canvas, is painted first inside a snuff bottle. 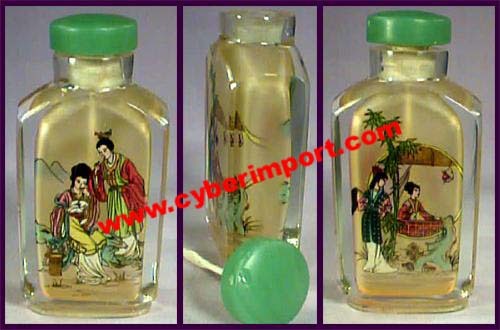 Bottle dimensions are 2" to 3 1/2". Unless noted otherwise, all are from China. 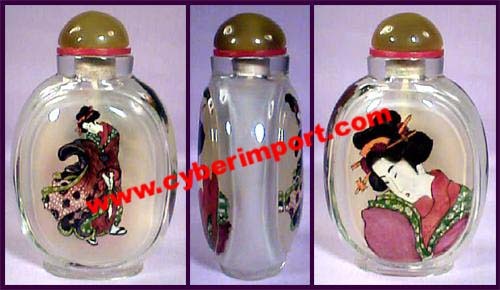 China Factory Minimum Quantity of these reverse paint geosha snuff bottle items can be negotiated with factories. Dollar Amount is often more important to smaller factories than the quantity of each piece. 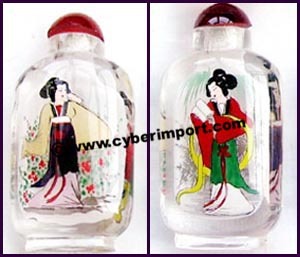 Minimum quantity often can be divided among several reverse paint geosha snuff bottle or stock numbers. Please inquire with us about your specific needs for smaller quantities than those listed. Smaller quantity can result in a bit higher price. Ask us for a quote. 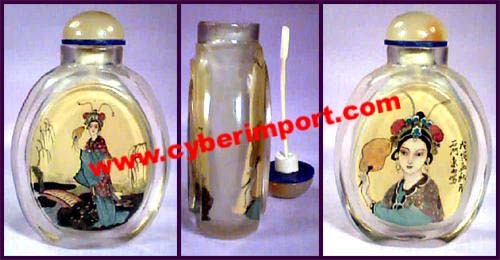 Custom Orders are possible with any of our reverse paint geosha snuff bottle products. Send us a .jpg example of what you want. If we don't have it, we can get it.